Many people--including a large number of legislators and regulators--argue that America's media marketplace is in a miserable state. Some claim that citizens lack choice in media outlets and that options are just as scarce as ever. Others believe that media "localism" is dead or that many groups or niches go underserved because of a lack of true "diversity" in media. Others argue that the market is hopelessly over-concentrated in the hands of a few evil media barons who are hell-bent on force-feeding us corporate propaganda. And still others say that the quality of news and entertainment in our society has deteriorated because of a combination of all of the above. It all sounds quite troubling, but is any of it true? After taking an objective look at the true state of America's media marketplace, we conclude that such pessimism is unwarranted. Indeed, a careful review of the facts reveals that---contrary to what those media critics suggest---we have more media choice, more media competition, and more media diversity than ever before. Indeed, to the extent there was ever a "golden age" of media in America, we are living in it today. The media sky has never been brighter and it is getting brighter with each passing year. We come to this conclusion by looking beyond the rhetoric that has for too long governed debates about media in American and providing a comprehensive look at a variety of media sectors such as audio, video, print and online media. Our survey contains over 70 charts and exhibits illustrating facts and figures on such diverse topics as advertising revenue, company market share, audience trends, and areas of growth in the sector. We will also aim to periodically updated the report to reflect the rapidly evolving media industry. We encourage readers to provider input about how to improve and expand the report going forward in an attempt to refine and improve the metrics. And we look forward to future debates on this subject--debates that we hope will be guided by facts instead of fanaticism and by evidence instead of emotion. The hyperbolic rhetoric, shameless fear-mongering, and unsubstantiated claims that have driven policy debates in recent years have no foundation in reality and should be rejected as the debate over media policy continues. 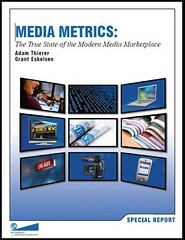 This and future installments of "Media Metrics: The True State of the Modern Media Marketplace" will be available on the PFF website at www.pff.org/mediametrics. I have also embedded the entire document below as a Scribd file so that those interested in the topic can peruse the report immediately.